The Foursquare social network has always been very focused on place – its key element being the “checkin” to the pub, restaurant or park you are in. The more ubiquitous social networks Facebook and Twitter have subsequently adopted the idea of checking in you (& your hopefully willing friends) but Foursquare was the pioneer and has amassed a huge set of data showing the social places that people visit. 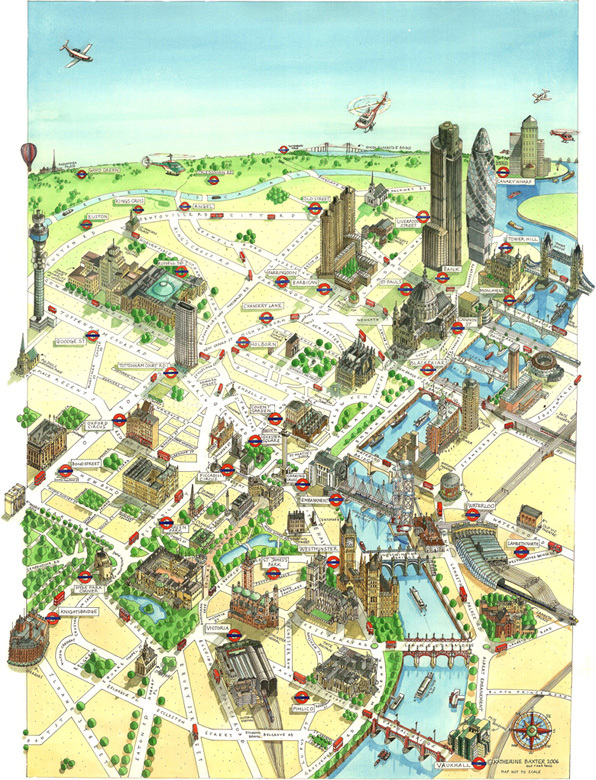 There are number of visualisations that have been produced, showing this activity for London and other places. Here are two. 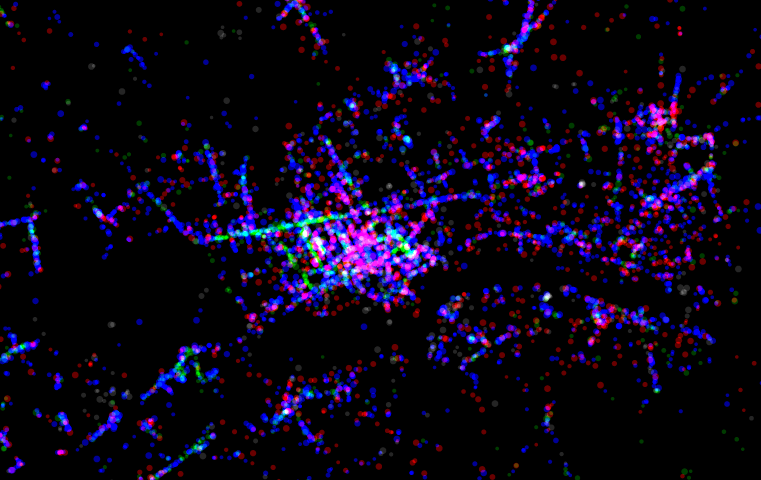 Above is Foursquare’s own visualisation, showing checkins over a 24 hours period in the capital, late last year. They have categorised and coloured each type of place (food, shop, nightlife etc) and also included checkins on a moving object (mainly trains/buses), showing this activity as a visually striking pulse of movement. Play the short animation and you can vividly see the commuter influx at 6-8am in the morning, and back out from the centre of London which starts at around 5pm, but carries on late into the even. Late at night, a few night services can be seen, such as the 24 hour trains to Gatwick Airport and Brighton. 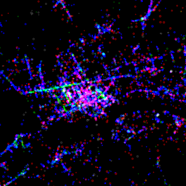 A similar idea is The Back of Your Hand by Stuart Robinson, using Foursquare checkin data. Checkins are grouped into Eat, Drink, Shop and Entertainment, each colour-coded – clusters of places being alpha-blended to increase their visibility. The website is interactive – you can click on a dot to find out the names of the establishment concerned. Like Foursquare’s own map, the traditional central London social clusters of Soho, Covent Garden and Shoreditch stand out, as do some other edge-of-centre hotspots such as Camden, Angel, Borough and Shepherd’s Bush. One more thing about Foursquare – they ditched Google Maps a few years ago and switched first to a MapBox render of the OpenStreetMap dataset. Their maps therefore look fresh and different! Goes to show how narrowly focused my social life is! That’s nicely done! Wish I’d used 4SQ myself.